Crystal Lake South High School was more than a secular learning institution in 1992. It was where Living Waters Lutheran Church (ELCA) held its first services. In 1996, the nascent church planted a new home on the city’s south side, not far from the school. Ground was broken in 2003, with the first service held on Nov. 7, 2004. The Rev. Rafael Malpica gave the new church a magnolia tree, still visible in front of the building, as a way to celebrate the purchase. Worshippers are invited to come as they are, whether donned in sports uniforms, business casual attire, or something in between. The congregation maintains a deep a commitment to its community and supports many local mission projects designed to help those in need. Every couple of months, church members serve food at Feed My Starving Children, in either Libertyville or Schaumburg. The church also donates and volunteers at the Crystal Lake Food Pantry, providing, among other things, assistance stocking shelves and sorting donations. During the warmer months, church members maintain a vegetable garden on the church’s property and donate their harvest to the food pantry. Living Waters members also participate in the annual CROP Hunger Walk each fall. Walkers collect donations that are used to provide food, medical care and disaster relief for needy people throughout the world. Pastor Dustin Lenz leads an 8 a.m. traditional Lutheran service each Sunday morning. The more contemporary 9:15 a.m. and 10:45 a.m. praise-and-worship services are led by the praise band. Some people believe this uniquely shaped church looks like a stylized barn silo, while others see more of an upside down ship or Noah’s ark. Still others think it’s like a covered bridge, with the portals leading to the altar of God. This latter concept was in the minds of the architects who designed this unique sanctuary, built in 1967, according to parish history. This congregation first began gathering in the 1850s and constructed its first building in DeKalb in 1881. 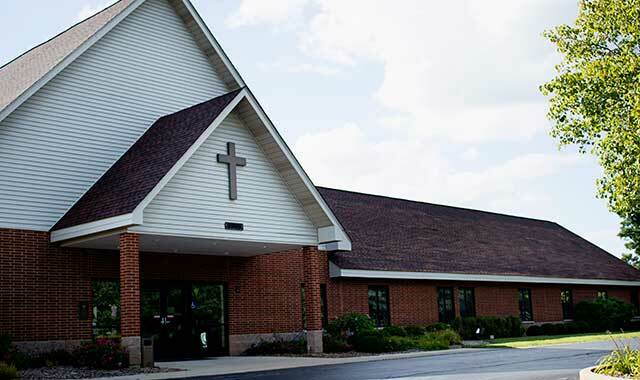 This current facility is their third church building, and it’s been conveniently planted just steps away from the campus of Northern Illinois University. In 2000, a fellowship hall was built onto the southeast side of the building, bringing a kitchen, large gathering room, nursery and parish offices, among other things. This may be a small congregation, but it plays a large role in the community. The church’s annual lobster boil is a decades-long tradition where nearly half of proceeds are donated to local charities including Hope Haven, which serves the homeless, and Safe Passage, which provides shelter for victims of abuse. The congregation also helps those in need during the holiday season, with projects such as the Thanksgiving food baskets that members assemble for the Salvation Army. Adult bible study is held Sunday mornings at 9:15 a.m., with Holy Eucharist at 10:30 a.m.
From September through May, a children’s Sunday school is offered at 9:30 a.m. This entry was posted on Tuesday, September 12th, 2017 at 11:58 am	and is filed under Mind & Spirit. You can follow any responses to this entry through the RSS 2.0 feed. Both comments and pings are currently closed.